By Gabrielle. Photos by Lindsey of Café Johnsonia. We are exactly 7 months into our new life in Oakland, and frustratingly, we are still trying to get a handle on our family schedule. Coming up with dinners continues to be one of our biggest challenges — and I know that’s not unusual for families everywhere. In fact, I get emails almost weekly asking for tips and suggestions about weeknight meals and menu ideas. And I get it. So often at our house, we find ourselves looking at our clock and saying, “Dinnertime already? !” At which point, we cross our fingers that there are spaghetti ingredients in the cupboards, or order out for pizza, or hit the drive-thru. But the whole family is pretty discouraged with the last-minute meals at this point, so Ben Blair and I have vowed to do better. Over the years we’ve gone through crummy eating phases now and again, so this isn’t the first time we’ve had to regroup. Luckily, at this point we know the big trick that works for us: We decide on the dinner menu before we start work that day. This works for us because we aren’t caught off guard when meal time rolls around, and we can also note if any early prep needs to be done during the day (like marinating something), and work it into our schedule. It’s also a chance to check that we have the needed ingredients, and if not, we can also plan a stop at the grocery store into our daily errands. I don’t know if this trick works for all families, but for us it’s magic! In addition to deciding the dinner menu first thing in the morning, we’ve also been making use of slow-cooking techniques. Yes, it’s great to have dinner decisions made when mealtime rolls around, but it’s even better to have dinner cooked and ready to go! 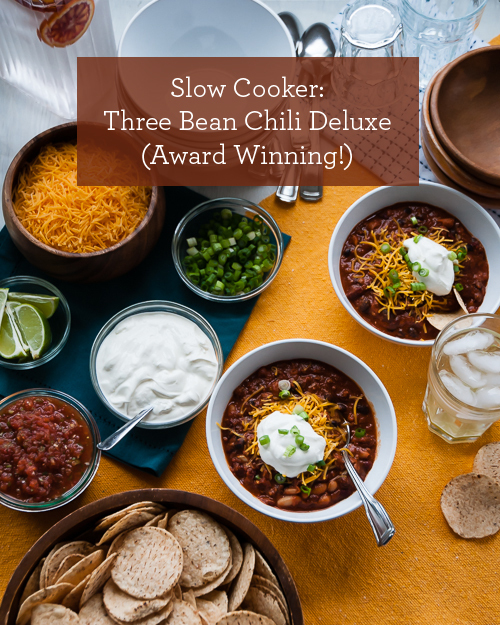 So I thought it would be fun to share a series of slow-cooker recipes that our family loves. Most will be longtime family favorites (like today’s recipe), and some will be new-to-us recipes we’re trying out. I’m super excited about this new series! I hope it will be helpful to you, and I hope you’ll share your own tips and suggestions on every post. As usual, I’d love to hear your thoughts! Are you in a recipe rut? Any particular foods you hope I’ll cover? Thoughts on the series in general? Let me know! One more note before we jump into the recipe: I don’t actually use an electric slow cooker! Since we work at home, and aren’t leaving the cooking food unattended, we typically do our slow cooking on the stove top in a heavy pot (as described here). But these recipes will work for any type of slow cooking — crock pots included! And now, without further ado, the first recipe in this new series: Award Winning Three Bean Chili Deluxe! The Blair family chili recipe has become legendary — it has been entered into chili-cookoffs all over the country. By us, by friends, by Design Mom readers. And it has won many, many times! It’s a pretty fantastic chili for several reasons, including how easy it is to make. It’s recipe my family has been making (and loving) for 14 years! 1. Have a large slow cooker ready. In a skillet, brown the ground beef with the onion and garlic. Drain the fat. Transfer to slow cooker. 2. Add the remaining ingredients. Place lid on slow cooker and cook on low for 8 hours, or high for 4 hours. We also think this chili is just right thickness for chili-cheese hotdogs. Yum! – If the chili seems like it’s getting too dry while it cooks, add a little more tomato sauce or water. It’s supposed to be pretty thick, but you don’t want it to burn on the bottom. 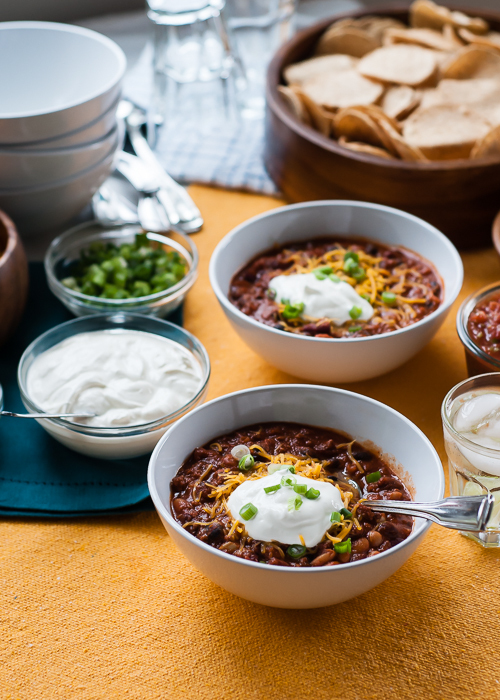 – This chili just gets better as it sits and the flavors meld. You can make it several days in advance. – This makes a big batch perfect for a big family or group. You can freeze the leftovers or keep them for about one week. – Our recipe isn’t very spicy. If you like a spicier chili add more chili powder and cumin, or add some cayenne pepper, to taste. P.S. — Need lunchtime menus? Check out this super helpful series of 23 lunch box menus your kids will love! Yes! Excited for this series. I can attest that this recipe is the best, we use it as well- thanks to the Blairs! I can’t wait to try this! Thanks for posting and I am looking forward to this series. Oh hurray! I’ve been in a cooking rut myself! I would love to see some vegetarian recipes, if you’ve got some. I’d like to second the request for vegetarian recipes (or modifications)! Thanks for the feedback Ginger and Ann! I ate a vegetarian diet for 3 years — but that was back in college. A long time ago! I love the idea of adding some vegetarian options to the series. For this particular recipe, withholding the ground beef and upping the beans would definitely do the trick! I’ve made this sans meat many times now and it’s fantastic! You definitely don’t need the beef (or even tempeh, TVP or anything like that – let the beans shine, baby!). I’m not great at following my own advice, but I’m always SO glad after I sit down on Sunday and plan out the week’s dinners and accompanying shopping list. My future self thanks me! Hah! I feel that way all the time. I am obsessed with the slow cooker!! I am a stay at home mom, but I have to admit, I hate cooking (am I allowed to admit that?)! I love throwing a few ingredients in the crock pot in the morning, and walking away until the evening. It’s what I call “fake” cooking, but my husband thinks it’s gourmet :-). He has been requesting I make chili for a couple of months now, but I have never had it and was afraid to venture into the chili world blind. Now that I have your recommendation and recipe, I am feeling brave!! I’m going to try it this week. Wish me luck!! For me, the hard thing about cooking is the relentlessness of the task — like laundry and dishes. I feel you on the ranch dressing packets. I make a recipe similar to Gabby’s and in an attempt to eliminate at least some of the yucky stuff, I have switched to Simply Organic brand ranch dressing packets. I can usually find them in the health food aisle of my regular supermarket or else I stock up on a trip to Whole Foods. They are not too pricey (less than 2$/pouch) and at least I know that the ingredients aren’t chemically derived or genetically modified. Not exactly “whole food” either (can you believe they even make organic maltodextrin? – from corn) but better than the old Hidden Valley…. Hi CTSarah! So glad you mentioned the Simply Organic ranch packets. It honestly hadn’t occurred to me to look for a more wholesome ready made option — I assumed I would need to make a packet from scratch and had no idea how to do it. I can’t say for sure how it would compare, but Penzey’s makes a buttermilk ranch seasoning mix (meant to be mixed with dairy ingredients for a dressing or dip) and the ingredients are very straightforward, i.e. easy to pronounce. What is in powdered Ranch dressing mix? I try not to use too many processed ingredients. Is there an alternative for this? Yes, yes, yes…..I have been in such a rut. I don’t like cooking to begin with so I don’t have the creativity to whip something together with what we have as I know some people can do. I will get a lot out of this series so thanks again for another great idea! PS – we are Canadians living in France right now so I hope I will be able to find all of the ingredients for the recipes. You may remember that that is not always so easy to do here. Yes to this series! We’ve been trying to use our slow cooker more often. What about using dried versus canned beans? Any suggestions? We try to stay away from cans because of the BPA in can liners. Penzey’s has a good ranch dressing mix, for those who are trying to avoid packets. Their ingredient list is salt, bell peppers, garlic, onion, sugar, black pepper, parsley, thyme, basil. For the Hidden Valley taste, you’ll want to add buttermilk powder, too. Thanks for the chili recipe – I plan to try it, ranch packet and all! I love this series! Our home has two work-outside-the-home parents and two toddlers – we need easy! We do our meal prep for the week on Friday night after the kids go to (while eating takeout). We shop on Saturday, and do prep/cooking on Saturday/Sunday night. We make large batches that will last the week and we love the slow cooker! Our kids go to bed between 6:30 and 7:00 pm, so one of us can run out to the store for any needs mid-week. PS: I like beans in my chili but my husband, the native Texan, declares this sacrilege. I’m looking forward to this series! As a mom who works outside the home, I use my slow cooker about once a week. I love walking into the house knowing that dinner is essentially ready. This recipe looks great – thank you. I am excited for this series, too. When you said you didn’t use the slow cooker, I thought you were going to say you use a Wonderbag. Have you or any readers ever heard of this or used one? I’m intrigued but not ready to commit. It looks like a good idea and a good company. This is such a good idea for a new series! Yay! I love to cook and do it every day. AND I have been quite taken with my Dutch oven ever since I got it. My biggest challenge is cooking in big batches. I make something and think it will last for a few days, but then we have supper, I split the leftovers for the next day between my husband and myself… and it’s gone! Not such a problem now with only two adults plus a breastfed baby, but potentially problematic with a bunch of hungry growing kids. :) That’s where I hope your designed-to-feed-a-family-of-eight recipes will help! The only way we make it through the week is I plan a menu. On Sunday I look through my recipes, make a grocery list, and plot out the entire week. It’s a life and time saver! Looking forward to adding this one to the list! I love sharing recipes and ways to help with the after school chaos. I find after school to be chaotic at times because we have different pick up times, activities, dinner to make, homework, and then just getting ready for the next day. At this moment in my life I find it very helpful to make a two week menu. It’s two weeks because I do our menu from pay check to pay check. It helps keep me on budget…sort of. Plus, it keeps me organized and while I can always change the menu I have something to go to if the thought of dinner seems daunting. I also find that if I prep things in the morning I can pull off a nice dinner. That means I chop any veggies, meat or such like items. I even go as far as to fill the pot with water if we need boiled water. I’ll fill the rice cooker with the rice and water and just have to push the start button. I find I am home doing laundry, picking up dishes and what not so adding dinner prep is pretty easy. I like to cook and I like being organized and ready when the kids are home. A favorite meal right now is Sesame Chicken. Often I will double the recipe so we have extra the next day. In a large bowl, whisk together the egg, 2 Tbsp cornstarch, and a pinch of salt and pepper. Cut the chicken into small 1 inch pieces. Toss the chicken in the egg and cornstarch mixture. -You can do this the night/morning before and put everything in a container or even a large ziploc bag. Heat a large skillet with 2 Tbsp of vegetable oil over medium-high heat. When the oil is very hot (it should look wavy on the surface), add the chicken and all of the egg mixture. Cook the chicken, stirring only occasionally, until it is golden brown and cooked through (about 7-10 minutes). Drain off the excess oil, if desired. While the chicken is cooking, prepare the sauce. In a small bowl stir together the soy sauce, water, sesame oil, brown sugar, rice vinegar, fresh ginger, minced garlic, cornstarch, and sesame seeds. Once the chicken is cooked through and golden brown, pour the sauce over top. Toss the chicken to coat in the sauce. The sauce will begin to thicken as soon as it hits the hot skillet. Once the chicken is coated and the sauce thickened, turn off the heat. Serve the chicken over a bed of rice and sprinkle the sliced green onions over top. The kids like to put soy sauce on it. Thank you so much for your thoughts — and for the recipe too! Sounds so yummy. Sesame chicken is one of my favorites when chinese takeout is on the menu, but I don’t think I’ve ever made it myself. It will be fun to try! I’m gonna try this one. Blair’s award winning chili is already in our rotation. Day to day doesn’t work for us. We try to plan a week in advance, looking at what has to be eaten (produce that might spoil otherwise, or food storage that needs to be put into rotation), what is in the freezer, and what is on sale that week. Then we make a menu for dinners for the coming week, along with who will be doing what, and if something needs to be pulled out of the freezer the night before, to thaw. If possible, we cook enough food to eat two nights in a row, or freeze an extra batch for to thaw on a night when we don’t have a lot of food prep time. Eating out or ordering in isn’t a financial option at our home. Our version of ‘fast food’ is scrambled eggs, or tuna salad, or grabbing a block of frozen soup from the freezer :) Cooking in large batches on weekends, using the slow cooker, has been a real time saver. Crazy!! I just came searching for this recipe this weekend…church chili cook off. I’m determined to win!! I have high hopes and expectations for this recipe! Crossing my fingers for you, Monica! As far as more recipes leads for you to cover, I’m actually trying to eat more meat (as opposed to the rest of the world that is trying to eat less). I’m getting over my thing about cooking meat. Chili counts, but I’d love to see other ways to use ground beef, for example! It’s one of my favorite recipe/lifestyle sites, written by a husband/wife writing team. The recipes are do-able and delicious – two things I need a recipe to be before I even attempt it. (Single mom here, with special needs child with a limited menu of foods). The site is gorgeous, well-written and ever so practical. They even give great rec’s of a wide array of books. It has so much going on for it – many of the same things that make Design Mom one of my favorite stops. I am also a big fan of Dinner A Love Story! So helpful and fun to read. Yes! Totally a fan. I think they do such a wonderful job. Back in the day I wrote up a post about them — but it’s been ages. Gabrielle! This is just what I needed! We moved about the same time (from OH to Denver) and are still in a dinner rut it seems. Thanks–this series is going to be awesome! 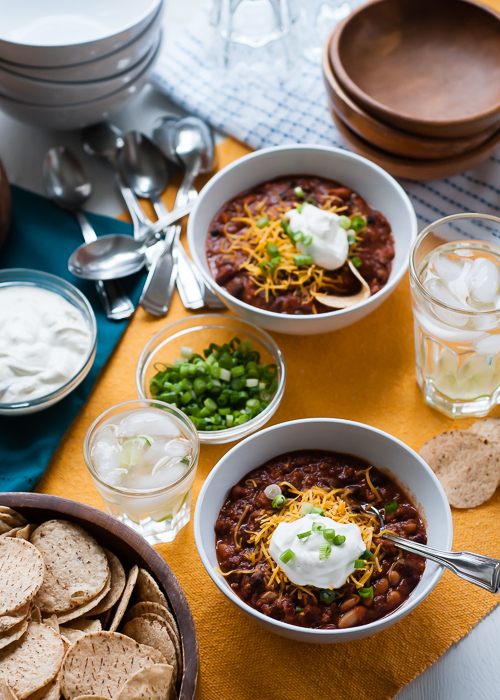 Side note–this has become our go-to chili. We love it, and everyone we serve it to loves it–it made a hearty Super Bowl appearance this year and helped to make up for the less than stellar game. Thanks! Yay! Using this recipe for the Super Bowl is genius. I try to plan a week in advance. That helps not only with knowing what we’re having day-to-day but also with grocery shopping. While I don’t always stick to the menu I created, it helps me know what we have ingredients for so I can swap the meals among days when that makes more sense. Otherwise I fall prey to the ‘deer in the headlights’ situation mentioned earlier. I’m really looking forward to seeing new recipes and since we eat mainly vegetarian at home, I’d love to see any suggestions you have there. I’m also so in love with Le Creuset Dutch ovens. I don’t have one, but it’s my absolute dream. Slow-cookers are a beautiful thing! Recently I made slow-cooker pulled pork and it’s a real crowd pleaser. I baked the rolls for the sandwiches, but any store-bought roll will do. Add some coleslaw and it’s a meal! I adore any slow-cooked shredded meat. It’s one of my comfort foods for sure. I’m so happy you’re doing this! Dinner time can be one of the most stressful times of the day. You’re so right, decide what’s for dinner before work. My husband and I try to figure out what we’re doing for dinner at breakfast. It doesn’t always happen, but when it does, the day goes much more smoothly. I’m glad you mentioned it as a way to be more organized about dinner. Can’t wait to try this first recipe! My family loves chili! This looks like a great recipe to try. In order to keep meal time under control in our house, I have to plan a weekly menu. Every Monday, I look at the calendar, make note of activities and decide which days need fast meals with little prep, and which days can have more care and time put into cooking. Slow cooking (or cooking in advance & reheating — perfect for soup!) has been happening a lot around here. Love this Shanna! So smart to have some easy rules of thumb so you don’t have to think too hard about it and can just get it done and know the results will be delicious. Oh, I love hearing about how other families handle dinner time! I try to plan 4 or so meals for the week and am flexible about what day I cook them. We try to avoid processed foods (like ranch mix) and as an added bonus this recipe is vegetarian (we’re not, but we like to have meatless meals a couple days a week). The blog Dinner A Love Story has great ideas and we also like 100 Days of Real Food. I just made this yesterday in the crockpot! It’s everyone’s favorite! Yum!! This recipe sounds yummy! Can’t wait to give it a try. I feel like I’ve been in a cooking rut for quite some time now and need a bit of inspiration when it comes to dinner. We’re always so busy with after school activities (why does the Y schedule kids’ swimming classes for 6:20pm?!) so dinner is quite often a rushed affair before the kids go to bed. Too often I fall back on 5 minute meals like pasta and tuna mornay. And even worse… because we live on top of a Trader Joe’s I find myself just grabbing their ready meals to microwave ALL THE TIME! I joined a recipe/shopping list site called “thefresh20.com”, and it has literally changed my life. It gives me my shopping list and 5 recipes every week. I go to the store once a week and by whatever is on the list. Even if I don’t know what I am cooking, I know I have everything I need for 5 meals (usually have enough for left overs too). It uses fresh food and gets me cooking with new foods. I love not having to think of what’s for dinner. Let me tell you…this recipe is heaven! I make it regularly and it is ALWAYS a family and crowd pleaser. Easy and super tasty! Thank you Blair family! For those who like a bit of heat, and bonus!, smokiness, try canned chiptoles in adobo (found in the “international” aisle at my grocery). You can use just the sauce in the little can, or, for more heat, cut up one of the peppers and add those, too. This is very similar to the chili my mom has been making for years! Only we use pinto beans instead of black beans and add Fritos to the toppings that make it super yum. Big families have to cook on a different size scale, I totally know from experience. I would love a discussion on teaching kids table manners as an offshoot on this topic. It seems we haven’t conquered them at our house. You referred to working hard on them in France. How did you do it? I love this!!!!! This is just what I needed!!! U r a genius!!! I’m interested to see where your series goes. I keep re-trying the slow cooker. It’s frustrating though to me that almost every recipe I try looks and tastes like every other recipe that comes out of my slow cooker. I agree that chili might be the exception except that a slow cooker really is only needed to keep it warm and help the flavor set in. Thank you though. This will be nice to read! This is awesome! Can’t wait to have it this week. My strategy is to use my store’s weekly ad to build a menu for the week(s) around what’s on sale, so I come home from the store (usually every 1-2 weeks) having most if not all that I need to make the meals I’ve planned. Saves my money and my sanity. I am positive I’ve seen this recipe here on Design Mom before, I remember thinking what a great recipe it was back then, too. Always on the lookout for great slow cooker meals! Is your youngest child in preschool? I am wondering if you find time to cook, clean, work and watch children at the same time?!? Thank you! I made this yesterday and my husband was FLOORED. It was so so good and very easy! We were both feeling under the weather and it helped to go to bed with warm tummies. I can’t wait to have the leftovers for lunch. Thanks again! We’re looking forward to this new series very much. This was great. It’s normally a whole big production for me to make chilli. It involves chopping tons of vegetables and cooking for a while. We stuck with a vegetarian version with Morningstar Farms veggie crumbles and I forgot the cream cheese by accident. But even without the cream cheese this was 30 minutes of work and I ran out of the house to go to the office. When I came home it was done and delicious. Great recipe and a huge time saver. Thanks! Made this today in a 15 year old hand me down crock pot from my dad– my first foray into slow cooker cooking! A huge hit all around — even with BOTH the 4 yr old AND the 2 yr old, which is almost unprecedented. Thank you! Looking forward to more slow cooker ideas. This looks yummy! I’m planning to make this in a couple weeks for a gathering of friends. Would you let me know how many servings the recipe makes? We’re expecting about 12 people so I need to know if I need to double the recipe. I felt like a bit of a traitor ditching the family recipe to enter in our annual chili cook-off for the church I attend, but after searching award winning chili on Pinterest, I decided to give your recipe a go. And what do you know, I won! I loved the chili and pretty much followed it to a T. Thanks for sharing your delicious recipe!! I hate cooking and with sports schedules it’s really getting challenging. I just found out my son has 4 volleyball games this week. Thanks to this recipe, maybe we’ll have one less take out meal. I need quick, healthy, portable dinner ideas. STAT. Know it’s quite some time after you posted this, but I made this yesterday and yum! It’s wonderful. I used a packet of spicy ranch dressing which helped give this a nice spice. I also was worried that 6 cans of beans wouldn’t fit in my crock-pot, as after 4 it was getting pretty close to the top! So I used 4 cans – 2 pinto, 1 black and 1 dark kidney. I also used ground turkey and didn’t even cook in advance. Delicious! I too attest that this is the best chili, ever! I however didn’t win last year, since I was up against a native Texan who always wins this particular chili cookoff. Will try this again this year, maybe add another 5 of my other fave chili ingredients, and see how I do :-). We won the neighborhood chili cook-off with your recipe! I’d never made it before, but it’s been on my list of things to do for a while. We cooked it for about 3 hours and it was incredible! Thank you for sharing your secrets!! I am about 6 hours in to cooking my chili. I am using a crock pot. The chili looks very watery to me right now. Will it thicken up? Or should I maybe add cornstarch+water mixture to it? What do you suggest? How big a slow cooker do you need for this recipe? I think mine holds 7 quarts. Oops. It’s actually 4 qts. Is that big enough? I just wanted to let you know I used your Three Bean Chili Deluxe recipe for a chili cook-off and won! The secret ingredient must make it a winner! I left this chili in the slow cooker for 8 hours and it did not thicken up at all. I checked on it it was so thin it was like soup. Followed the recipe exactly as it said, do not recommend.